DUBLIN CITY COUNCIL has issued a tender for a new homeless case management system which will include a booking system for homeless accommodation. The €500,000 tender is for a three-year contract to develop software and computer packages. The contract also includes the provision of training for staff who will be using the system. This system would replace the Pathway Accommodation and Support System (Pass), which is used by homeless service providers and all local authorities in Ireland, including Dublin City Council. The current system provides real-time information about presentations of homelessness and emergency bed occupancy across the Dublin region. 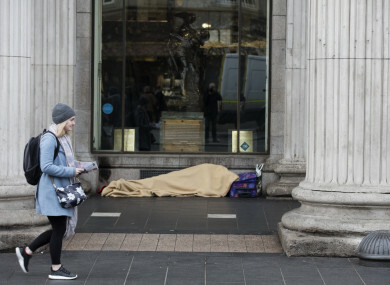 Brian McLoughlin of Inner City Helping Homeless (ICHH) told TheJournal.ie he hoped this reform would include a change to the call-up system for service users to book a bed for the night. For emergency accommodation users, the current system for booking a bed for the night involves calling a freephone number that will log the call in a queue. Then the system calls back the service user and they are placed on hold in the queue until an operator is available to speak with them about booking a bed. McLoughlin said the system is “frustrating to use”, even for service providers like his charity which has a lot of experience with it. A spokesperson for the council’s Dublin Region Homeless Executive said the rationale for this tendering process is to “ensure that this vital system operates effectively and efficiently, provides optimum functionality and capability, and is consistent with best international practice in this area”. Email “Dublin City Council issues €500k tender for homeless accommodation booking system”. Feedback on “Dublin City Council issues €500k tender for homeless accommodation booking system”.